For more than two generations, governments and medical authorities have been pushing a misguided pro-carbohydrate, anti-fat agenda. This misinformation is one of the main drivers of our modern obesity epidemic, as well as many related health problems, such as diabetes, high blood-pressure and chronic inflammation. But a customized Ketogenic diet that’s rich in healthy fats can eliminate many of these problems. Metabolizing fat requires little or no insulin, and it doesn’t cause blood sugar spikes. That’s why sticking to a customized ketogenic diet menu will repair your insulin sensitivity. When eaten with protein or fibrous, low-carb foods – as in a good ketogenic diet – fat is very satiating. In fact, some fats are satiating in their own right. And these should be at the top of your ketogenic diet food list. Medium-chain triglycerides (found in coconut oil and MCT oil) suppress appetite. The same is true of oils with high levels of oleic acid – extra virgin olive oil (EVOO), avocado oil, pumpkin seed oil and oils from some nuts, such as hazelnut, macadamia, pecan and almond. Canola and sunflower oil also have high levels of oleic acid, but these two oils also have properties that make them unhealthy. Avoid them – they should not be part of your ketogenic diet foods. It’s easy to incorporate medium-chain triglycerides and oleic acid oils into a ketogenic diet plan. You can cook with coconut oil and EVOO; splash olive, avocado or macadamia oil liberally on your salads and vegetables; and add MCT oil to your coffee or salad dressings. Pro tip for ketogenic diet weight loss – chew some pumpkin seeds, eat half an avocado or drink a tablespoon of extra virgin olive oil about half an hour before a meal. You’ll feel fuller sooner, and you’ll eat less without feeling you’re depriving yourself. High-carb diets train your body to burn sugars and starches more effectively. Burning carbs for energy means you need a steady supply of carbs to feel alert and vigorous. It also means your body struggles to burn stored fat. On a low carb diets, such as the ketogenic diet, your body will first burn the tiny amount of carbs you have eaten, then it will access and break down stored body fat. You’ll achieve better insulin sensitivity, appetite control and a fat-burning metabolism. But eating a diet rich in healthy fats and low in carbohydrates will not only help you achieve and maintain a healthy weight – it also delivers many other benefits. Cell membranes are made largely of fat, and high quantities of healthy fats are needed for optimal absorption of vitamins A, D, E and K.
If you eat too little fat – or too many artificial trans-fats or bad oils (sunflower, safflower, corn, soybean, canola and “blended vegetable oils”) – you’ll develop health problems and age badly. The quality and quantity of the fats we eat are important for many aspects of health. Brain and cognitive function: our brains are 60 percent fat, so the fats we eat affect the quality of our brain tissues and the clarity of our thinking. EVOO has been shown to be neuroprotective and MCTs boost brain functioning. Whether you eat good fats or bad fats has a lot to do with Alzheimer’s Disease risk. Mood and mental health: healthy fats, such as olive oil and fish oils, have been shown to alleviate anxiety and depression. 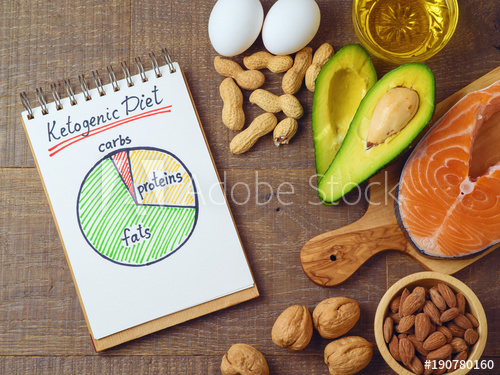 Hormones: fats and vitamin D (which is only found in oily and fatty foods) help the body produce and regulate estrogen, testosterone and other hormones. Inflammation: healthy fats – especially from olives, avocados, coconuts and fish – are strongly anti-inflammatory. Heart and blood pressure: many studies have shown that olive oil is good for the cardiovascular system and blood pressure. Fish oil has similar benefits; but it spoils easily, so if you are supplementing make sure you get a good brand, keep it in the fridge and take it with the d-alpha tocopherol form of vitamin E.
Skin and hair: fats are the foundations of healthy skin cell membranes, and they also help moisturise and hydrate the skin. Studies have linked olive oil and fish oil with healthy skin. Aging: the fats we eat can affect aging. Olive oil and oily fish have been shown to assist healthy aging. Building your DIET that is RIGHT FOR YOU can make you slimmer, healthier and happier!